Where does the mind go when a person of such enormous vitality is confined to a body not quite used up? What happens to the hellions, and cynosures, the “Bad Pennies” who outlast their adventures yet find their way to the nursing home? My grandmother, Mary J. Rafferty, is one such person. Born in a Chicago taxicab one wintry day in January 1915, she has traveled far from her unconventional beginning. 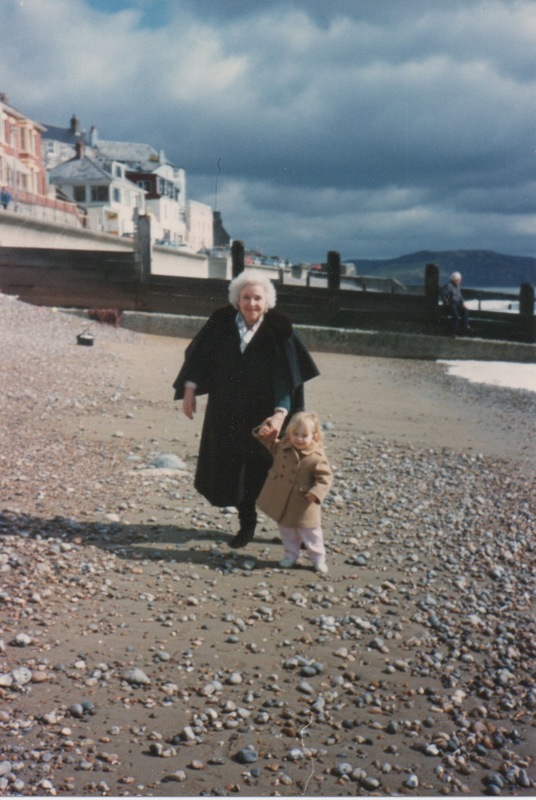 Today, at 98, she journeys in memories, carried now on bright wings of practical fleece. Nothing, not even the confines of her hospital bed can arrest her. Haplessly, I’ve escorted her to the chair exercise class, the Sunday service and the concert, only to have her announce on arrival with a look of consternation and a voice shrill with rebellion, “Not this…No, I HATE this!” Despite her many years, she is ageist, dislikes old people, refuses to “be” old. There are many stories I could tell you by which you’d measure her extraordinary life, her zeal, and her eye for beauty. In her prime, she talked her way onto Marlon Brando’s private island for lunch. She dropped in unexpectedly to visit A.S. Neill at Summerhill and saw the students burn the classroom furniture. She toked with Neil Young at his estate in Woodside and was invited to drop acid–not once, but twice–by members of Jefferson Starship. Until age fifteen, she rode an adult sized tricycle, impervious to the comments and jeers of her age mates. She disdained ill will, chalking it up to a limitation in reason. She was the essence of empowerment, assertive and driven, and derived that power at no one’s expense. Gracious, thoughtful, artfully dressed in eye-catching clothes reflective of her travels, she was a wonderful raconteur and could see the merit in anyone, especially, any man. Even in the nursing home, she maintained a string of paramours, the youngest, Dr. Joe, a former pioneer of open-heart surgery, now her boy toy at 97. One day in spring of 2007, the house phone rang. I, now the owner of her beautiful, old Cape Cod Style house, answered it. As always, I braced myself. The phone–black, dial faced, hardwired to the wall–had been in its location since 1962. It was the lost letter office of the family, the place you called with news of births, marriages, divorces, and deaths. It was the way to spread news to every lowly branch of the now widespread Rafferty clan. Hearing the phone ring, I answered it with some trepidation, short on time. “Hello, Rafferty residence,” I said, even though it wasn’t anymore. “Yes. How can I help you?” I answered, curiously. Adjusting my purchase on the phone and grabbing a chair, I sat down to give this my full attention. “I’m sorry, but Mary doesn’t live here anymore.” I waited to hear her response, key evidence in determining if this was an old friend or just another phone scammer preying upon the elderly. “Oh, excuse me, I didn’t want to trouble you without due cause. My name is Cindy Nickerson and I am a biographer,” she replied brightly. Now, genuinely curious, I queried, “Maybe I can help you. I’m her granddaughter and have Power of Attorney for her. I handle her affairs.” I meant it, literally. I paused thinking it over. It’s hard to say. She visited MANY places back then, was quite the rover, and possibly, Cape Cod was on her list. “Well, she could have. I know she traveled frequently. She was an antiques dealer.” I replied. “Well, I’ve been searching for two years for Mary Rafferty. I’ve tried every Mary Rafferty on the East Coast and all through the Midwest and have been working my way west from there” Cindy offered. Immediately, I sensed the letter WAS written by Mary J. “Go on please,” I said. “Can you tell me anything about her handwriting?” Cindy inquired. “May I read you a short segment of the letter to confirm it was written by her?” Asked Cindy breathlessly. Clearing her throat, Cindy read the first two sentences carefully with emphasis on each word, though from the direct, opinionated tone and ladylike yet suggestive speech, I deduced its author immediately. “Yes, she wrote it,” I said. “I would be very interested,” said I. Knowing my grandmother sketched, I expected it would resemble the bags for her shop with her quaint yet authoritative drawings of Welsh Dressers, Staffordshire Spaniels, Cannonball Andirons, and Irish Hunt tables. The next day, I received the following attachment to an email. I don’t actually know why I should be writing to you tonight because I told you repeatedly today that I like your paintings very much. But it is very strange. They excited me so that I cannot stop thinking about them. I consider their discovery the greatest thrill of my trip and I have never run into anything so spellbinding and spot-hitting to me. As I drove along, I could not wipe the smile off my face – remembering their hilarious absurdity combined with smashing authority. They are the way I like the world to be – clear, colorful, understood, yet imaginative, fanciful, tongue-in-cheek, and fun. The surprising thing is that they were made by a reserved, apparently serious, understated sort of person like you seem to be. If one saw just your pictures, one would think they were done by some uproarious fellow – I simply cannot think of whom – they are so unprecedented. This appreciation does not mean at all that I can buy one. … But whether I do or not, I just thought you might get a kick out of knowing there is somebody who was more moved by your work than by anything she saw in the Louvre. In any case I will go to your show in Carmel and make some other people come with me. This is only the text of the letter. Suffice it to say, my grandmother’s drawing was not just in the style of the artist, it was a self-portrait, done to his favorite theme. If you are unfamiliar with the work of Ralph Cahoon, he loved mermaids and depicted them in various secular pursuits–baking cakes, tattooing sailors, partying with whales, climbing trees–yet always half naked with prominently displayed breasts and buttocks. This is how my grandmother drew herself for the artist’s appreciation. White hair, beautiful sinuous fish tail, resplendent and bare breasted with an unmistakable, come hither look. She was 51 years old at the time. A few days later, I visited my grandmother. I brought her pictures of Ralph Cahoon and his work, hoping to spark some memory, or better still, some humorous confession. Seeing the drawing and knowing her, I suspected she was not subtle about her interest while in his presence. I showed her picture after picture. She squinted, she looked, she smiled, yet nothing sparked recognition. She must be too far-gone to remember I concluded. Having gone through roughly fifteen pictures, her face suddenly lit up, she developed a happy smile reminiscent of long ago sunny days, and seemed prepared to effuse words profound. “What is it grandmother?” I asked expectantly. “I remember these…I remember this artist!” she said, rather wistfully. Grabbing a notepad to jot down whatever pearls might then come, I waited eager and attentive. Marsha, thanks. She was feisty and classy and wonderful. And here physical constitution was amazing. Towards her end, after she stopped drinking water or receiving fluids, she lived another 13 days. Next time someone says “you can’t live more than three days without water”, think of my grandmother. She did. How I miss her. Just a gorgeous story! Wish I’d known her. But I guess I know *some* of her (through you). She would have liked you Roslynn.